From the The Simpsons collection by ICUP. The Simpsons Friends and Family Can Cooler. This Item is in stock and ready to ship. You should not postpone your purchase and miss out on adding The Simpsons Friends and Family Can Cooler to your The Simpsons collection! From the The Simpsons collection by ICUP. The Simpsons Friends and Family Can Cooler. 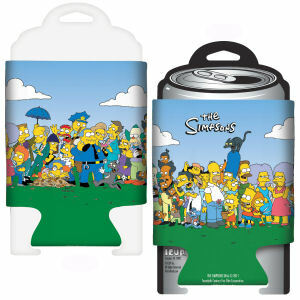 Keep your can of soda pop cold with The Simpsons Friends and Family can cooler. Features wrap around design with all tha simpsons characters. ICUP Simpsons Household Items shipping from Canada. No Surprise Border fees or Customs!